The Borneo Convention Centre Kuching, is a unique location with a space created among the tranquility of the tropical rainforest where any distractions are kept at a distance but yet still easily accessible. Located in the heart of Kuching, Pullman Kuching offers astonishing panoramic view of the city and the Sarawak River. Located within walking distance to commercial centre and city attractions, with paths leading to and from the Kuching Waterfront Promenade. This ensures guests can easily venture on foot to discover the city’s diverse selection of shops, restaurants, temples and bazaars. 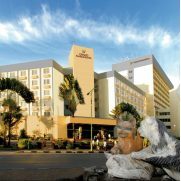 The Hilton Kuching hotel is situated on the waterfront of the striking Sarawak River, this central Kuching hotel boasts captivating views over the city. The Hilton is conveniently situated just a 25 minute drive from Kuching International Airport and within walking distance to many popular attractions. All rooms feature high-speed internet access. Sarawak's first international hotel, the Grand Margherita Hotel is situated by the riverfront. Located in the heart of the city's business, entertainment and shopping district, the hotel is just a 20 minute drive from Kuching International Airport. The Grand Margherita Hotel is adjacent to the Sarawak Plaza Shopping Complex and the Sarawak Economic Development Corporation Building. The Riverside Majestic Hotel is strategically located in the heart of Kuching's business, entertainment, dining and shopping district just 20 minutes drive from Kuching International Airport. Overlooking the Sarawak River, the hotel commands a panoramic view of the city and the spectacular waterfront.